Gwithian Towans is a great place for a long beach walk, and even greater if you can ensure you end up at Godrevey Cafe for a half time break. You can also cheat by parking up in the adjoining National Trust car park. Great beachside food for morning, lunch or afternoon: the only drawback is that it’s usually packed and you may have to wait a while. On the other hand, why be on the beach if you’re in a hurry? There’s seating inside and out, but the prime pitch is on the top deck where you can take in great views over dunes and sea. 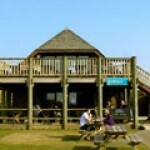 Godrevy Cafe is at Gwithian, Hayle TR27 5ED. 01736 757999. Open 10:00 to 17:00 daily (weekends only in January) with longer hours in the summer season.